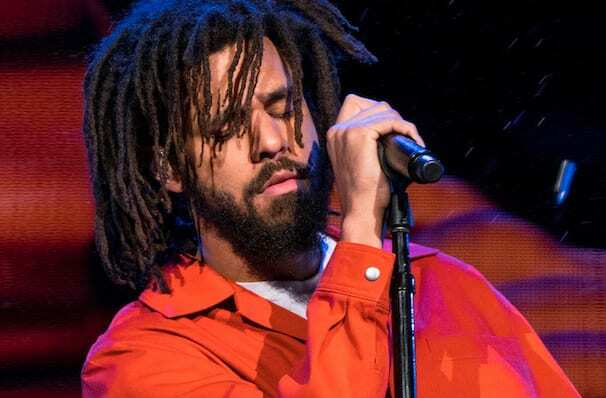 North Carolina rapper J. Cole hits the road once again to tour his latest album, KOD. Kicking off in Miami, Florida in August - the tour will run for 34 dates before concluding in Boston. 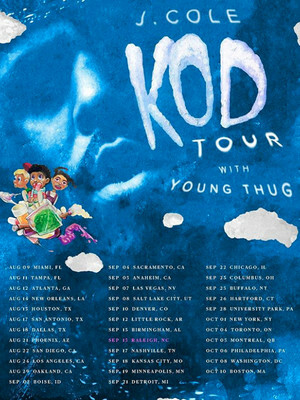 Joining him in support on every date and stop will be Young Thug! In 2014 Cole released his Forest Hills Drive album, a record which secured Cole's status among the genre's elite. Featuring the singles Apparently and G.O.M.D, the album mainly dealt with Cole's upbrining and his eventual move to New York from his childhood home in Fayetteville. His latest album, KOD, upon release had broken multiple first-day streaming records. Expect to hear tracks 'Photographs', 'Kevin's Hart' and 'Motiv8' on this upcoming tour! Sound good to you? Share this page on social media and let your friends know about J. Cole at Schottenstein Center. Please note: The term Schottenstein Center and/or J. Cole as well as all associated graphics, logos, and/or other trademarks, tradenames or copyrights are the property of the Schottenstein Center and/or J. Cole and are used herein for factual descriptive purposes only. We are in no way associated with or authorized by the Schottenstein Center and/or J. Cole and neither that entity nor any of its affiliates have licensed or endorsed us to sell tickets, goods and or services in conjunction with their events.